Overview: Solidworks Training Course Although this class is designed for beginners, it is much more than a beginners course. We teach participants how to design products, as opposed to simply how to use the software. You will, upon completion of this course, be able to utilize dimension manufacturing features in 3D, check dimensional completeness, graphically display dimensional status on 2D drawings, and create complex parts. Automatic interference and collision detection makes sure all parts fit together before you build a physical prototype, reducing cost and shortening the overall design cycle time, for faster introduction to market. The design for this Solidworks training workshop is an introduction to constraint based modeling, utilizing the latest release of Solidworks. This workflow oriented training course focus is on core-modeling skills in a comprehensive manner which includes topics such as sketching, SolidWorks part modeling, SolidWorks assemblies, detail drawings, and basic model management techniques for changing designs that others may have created. We also cover alternate workflow ideals that set users up for other modules. 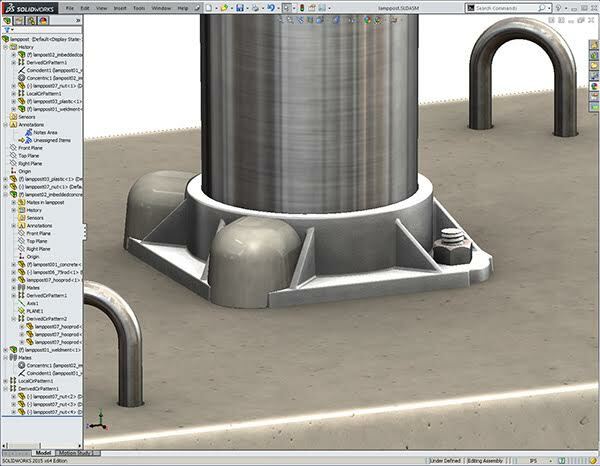 The basic SolidWorks Modeling techniques taught in our Level One class are often not utilized by even the more seasoned & advanced users in your office, especially if they have not previously participated in a Design Engine class in the past. This course includes over fifty comprehensive design tutorials or small projects that enable one to practice these new design workflow & skills by creating parts, assemblies, and drawings and making many changes. The exercises in this SolidWorks training course are designed to give users the utmost confidence and experience all within one week. Onsite Training: This and all Design-Engine courses are offered also onsite at your facility. Call to speak to an account manager to arrange a class at 312.226.8339 today. Projects: Model and detail a desk vice. Participants will also modify an existing assembly of parts with interference issues. Prerequisite: Mechanical aptitude and a desire to learn SolidWorks. Cover new items in SolidWorks 2016 or 2017. Solidworks sketch utilities including 3D curves. Conics and rebuilding curves to higher order. Light introduction to using surfaces as tools to effect solids. Create features: Extrudes, Lofts, Patterns, Shell and Draft. Equations: Create relationships between features using equations & global variables. Detail drawings for documentation and assembly detail drawings complete with exploded views. Modify features and edit references. Utilize Edit Feature and Edit Sketch. Engineer Change Orders: Learn to edit parts (with certainty) that others have modeled. Learn to use drawings not only to document models but as design tools for controlling snap fit and accuracy. Learn to create and edit assemblies with SolidWorks. Learn to organize yourself for developing a project. 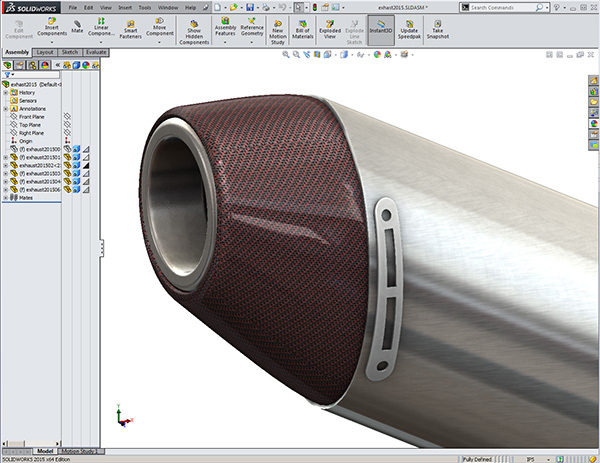 Learn to use basic render tools inside of SolidWorks. Learn to use top-down design and leverage the tool appropriately and later learn to dissociate to the top-down model so the part can be used without previous associations.. Discuss Edit Sketch & Edit sketch plane complete with examples. Change and modify features, parts, and assemblies. Discuss how to approach a project with examples. Discuss editing parts others have modeled. Discuss using surfaces by themselves and within parts. Patterns and how to add features to patterns effectively. Discuss several top down modeling approaches for developing products. How to design mechanisms complete with surface detection complete with examples. Introduction to constraint based modeling, assembly, detailing, and making changes utilizing the latest release of SolidWorks. This SolidWorks course is developed for new users who want to become proficient learning SolidWorks in just one week. We help you learn SolidWorks, not read to you from a book or an exercise. In this course we help design engineers learn how to make changes quickly to set them up for becoming experts faster. As with all Design-Engine classes, participants keep the training material login and password for life. Ask your Design Engine account manager about the Design-Engine Video Training Delivery System or TDS for short. We have prepared this entire class in an easy to follow guide for designers and engineers who may want this TDS as a supplement to this course. Call today to speak to an account manager about the details at 312.226.8339.